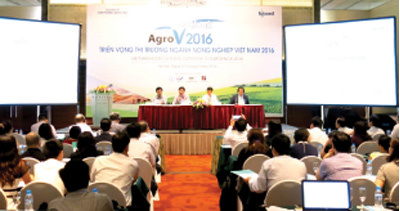 (VEN) - The domestic agricultural market is predicted to face big challenges this year. Therefore, agricultural market orientation and expansion, product quality and infrastructure investment should receive more focus, experts have suggested. Domestic agriculture is bearing the brunt of droughts and saltwater intrusion which has reduced the output of key agricultural commodities including rice, rubber and coffee while affecting the export of agricultural products, said Dr. Nguyen Trung Kien, Head of the Commodity and Market Unit under the Institute of Policy and Strategy for Agriculture and Rural Development (IPSARD) at the Vietnam Agricultural Outlook Conference 2016. While some countries have devalued their currencies to boost export, Vietnam decided to maintain the Vietnamese dong anchored to the US dollar and subsequently made it relatively stronger in comparison with some other currencies like Brazilian Real, Colombian Peso, Indian Rupee, Indonesian Rupiah, Malaysian Ringgit and Thai Bath, said Dr. Tran Duc Thanh, Director of the Hanoi-based Vietnam National University’s Institute for Economic Research and Policy. IPSARD Director Nguyen Do Anh Tuan was rather optimistic when saying that domestic agricultural products may benefit from China-Philippines trade tension as a result from China’s sanctions on bananas imported from the Philippines. In addition, there was also room for domestic agricultural products in some demanding markets like Japan, the US, Australia, New Zealand, the Republic of Korea, the EU, India and Chile. Vietnam is home to tropical fruits like dragon fruit, litchi, mango and rambutan, which are predicted as key export items until 2024, contributing significantly to the country’s agricultural revenues, especially in the next decade, said Sergio Rene Araujo-Enciso from the Board of Trade and Markets under the Food and Agriculture Organization of the United Nations (FAO). In the short term, Vietnam should focus on improving agricultural product quality to meet the increasing requirements of international markets, while in the long term, should pay attention to agricultural commodity restructuring to increase the added value while reducing costs, Nguyen Do Anh Tuan said. Vietnam should continue the efforts to remove export barriers, increase investment in rural infrastructure development and raise farmers’ ability to cope with the new circumstances arising from the international integration, said FAO Representative in Vietnam Jong Ha Bae. In the first quarter of 2016, Vietnam recorded decreased export value. Rice and coffee exports to key markets including Germany, the US, Japan, Belgium and Russia fell, meanwhile wooden furniture, pepper and cashew exports increased.